Diane Sauce also known as Steak Diane, was popular in American restaurants in the 1940’s and 50’s. 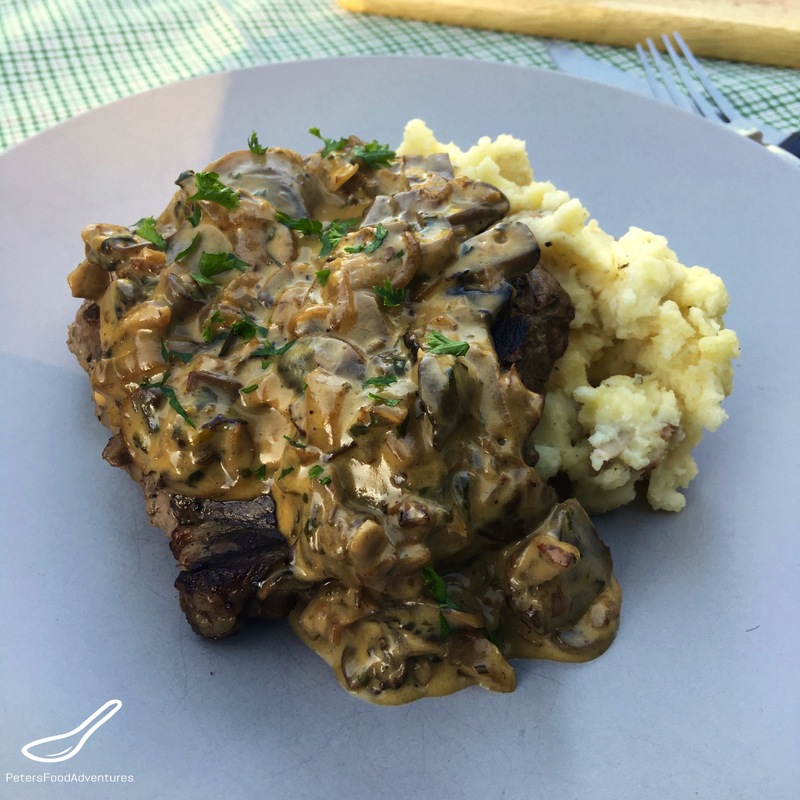 It’s a mushroom gravy sauce which is served with your steak, which is flambéed for dramatic effect. It was popular to have it flambéed table-side in a restaurant. This ensures the alcohol from the brandy is burned off, leaving the classic. Now I probably use too much mushrooms, as I love mushrooms. You could use only 2 or 3 sliced up for flavor, and keep the sauce runnier, but who loves a runny mushroom gravy? Often this recipe was made by pan frying the steak, then making the sauce in the same pan, using the steak juices. I usually barbecue our steaks outside and make the sauce in a saucepan. Some people use thinner minute steaks, but I like a proper thick steak with this recipe. This sauce can be made in advance, as it re-heats easily. I thinly slice the mushrooms, but you can chop the mushrooms into small pieces if you want a smoother sauce. You can use any brandy or cognac that you have at home. You don’t need to spend a lot of money on the brandy. As the brandy is burned off, the differences in quality of cognac or brandy won’t matter as it mixed with the food. So it’s ok to buy the cheap stuff. Don’t skip the brandy, that’s what gives this dish amazing flavor. Otherwise it’s just a plain mushroom gravy. If you don’t have brandy, you can substitute with Port Wine (which contains brandy). It won’t flambé with port, just let it simmer for the alcohol to cook out. The only caution I have is when you add the brandy to the saucepan. Carefully tip the pan to the flame on a gas stove to ignite the brandy, be careful not to burn yourself, or the kitchen down. Alternatively, use a firelighter to light the brandy. Did I mention to be careful? Many people confuse this as a French recipe, but it is in fact an American recipe. It originated from New York, commonly thought to be originated by a person called Nino of the Drake (from the Drake Hotel). His real name was Beniamino Schiavon, and he was an Italian immigrant. So it’s definitely not French, but an American classic recipe. I have never made Diane Sauce before I came to Australia. It’s just wasn’t popular in Canada, but I wish it was. Most Australian pubs or restaurants seem to have it as option along side their gravies and sauces. However, it’s gone out of fashion to flambée table-side in restaurants. You can even buy it as an easy powdered gravy in the supermarket. But made from scratch always tastes better! I love eating Diane Sauce over my Mashed Potatoes or even dipping my Potato Wedges or French Fries. You can’t go wrong with a tasty sauce. Modern food has gotten trendier. It’s way too cool for a delicious, buttery, mushroomy, calorie-laden gravy sauce. It may not be considered a fancy dish anymore, but boy, is it delicious. One of my favorite ‘retro’ recipes. Bon Appetit! Приятного аппетита! Diane Sauce is a creamy brandy steak sauce or mushroom gravy, with an easy to follow recipe. A classic American flambéed steak sauce, a flavor showstopper. A retro recipe popular in the 1950's. Put oil in a frying pan and fry onion until soft. Add mushrooms, garlic and butter and cook for about 2 minutes. Add Worcestershire Sauce and Dijon mustard and any steak juices to the frying pan and stir together. Add the brandy and cook until the alcohol has burned off. Add the whipping cream and cook until the sauce thickens slightly. Add parsley and season with salt and pepper. The next sauce that will make sure this. You’re welcome! My favourite part is lighting the brandy, boom! 🙂 It’s so good! I miss the restaurant where I used to order Steak Diane. It was fabulous! Love your photos! ???? No, it IS a fancy dish. And so much time has passed since the 40’s, that now it qualifies as being exotic. I’ve seen this recipe in some iconic, vintage cookbooks and have always wanted to try it. Thanks for the inspiration! Thanks Jeff! It’s sad when good recipes fall out of style! Hope you give it a try! ??? ?